I've been fortunate to have received many of Shiseido's launches in years past so I've been able to find a lot of things I love from the brand. I recently stocked up on a few products I was running low on and thought I'd jot down some mini reviews. I just cracked open my third tube of the Shiseido Full Lash and Brow Serum because my lashes have never looked better since using this. This lash serum has lengthened my lashes a considerable amount and I just love the way my lashes look when I'm diligent about using this. I'll probably be buying this as long as they keep making it because my lashes just don't look nearly as good if I stop using this for a few days. Another repurchase is the Benefiance WrinkleResist24 Pure Retinol Express Smoothing Eye Mask (what a mouthful!). I bought the 12 pack box which will last me a couple of months. I've used many eye masks but these take the cake for sure. These masks plump up the under eye area and it has a pearly essence that brightens the skin really beautifully. I love using these the night before a special day. Because I like the Benefiance Eye Masks so much and I'm also a fan of the White Lucent range, I bought a few of the White Lucent Power Brightening Masks to try. I'm happy to report these full-face sheet masks are very nice as well. The cotton is very plush and the mask does seem to help fade acne scars in conjuction with the White Lucent Serum. I would repurchase these for a special occasion if I need my skin to look especially radiant. I've used probably every sunscreen in Shiseido's line up and they are generally the ones I recommend when people ask me which I like. I picked up a new tube of the Urban Environment UV Protection Cream SPF 40. Most of their sunscreens now have Wetforce technology, which is great if you're going to be sweating or swimming but it can be hard to remove at night. The Urban Environment Cream is water resistant but I find it to be more gentle on the skin for daily use. The last product I want to mention isn't a repurchase but one of Shiseido's newer eye creams, the Bio Performance LiftDynamic Eye Treatment*. I use this eye cream in the mornings and I find it to be similar to the Shiseido Bio Performence Glow Revival Eye Treatment which I recently used up. The LiftDynamic Eye Treatment has a slight pearly sheen but it sinks into the skin nicely and preps the under eye area for concealer. I can't attest to the anti-aging benefits of eye creams since I don't have many fine lines or wrinkles yet but I can say these Shiseido eye care products help my concealer go on a lot nicer. I've used up a bunch of skincare products lately and introduced some new ones so I'm planning on doing an updated skincare routine post soon. What skincare brands do you swear by? 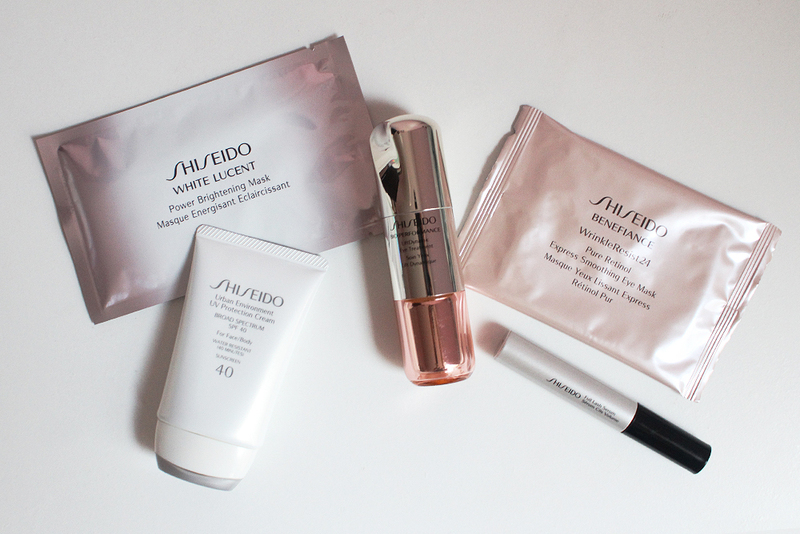 Have you tried any of these Shiseido products? *The Bio Performance LiftDynamic Eye Treatment was provided by PR. All other products were purchased with my own money. This is not a sponsored post.